Sisterhood is a diverse group of women, from working professionals to stay-at-home moms, ranging in age from 20s to 80s. We are single, single parents, married, married with children, divorced and widowed. Join us for our monthly meeting, beginning at 9:30 a.m. with a light breakfast and brief business meeting in the Temple Israel Library. Sisterhood Donor Event 2018 – Saturday, November 17, 2018, 7:00 p.m. 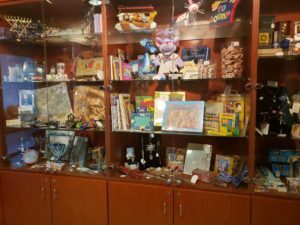 The Temple Israel Gift Shop features a wonderful array of Judaica such as books, cookbooks, jewelry, and ritual items for your home and holiday or gift giving needs. Don’t forget the granchildren – colorful Tzedakah boxes, puzzles and games. Stop in and browse. Cash & checks are accepted. We do not accept credit or debit cards.